CONCEPTUALIZING the meaning of a word is often contextual. And what better way it would be to remember a complex word using pictures in a given context! DailyVocab, a start-up at MICA plans to do just that. According to founder, Anshul Agarwal, “English language learning is a serious problem in India and needs to be solved. One way to make the learning interesting, is through ‘Vocab Meme’ that teaches word power using Internet memes which are quite popular among youth and shared/liked frequently on various social media platforms." Dailyvocab.com is particularly useful for students who are preparing for competitive exams like GRE, CAT, SAT, IELTS, TOEFL and Bank PO. It is also useful for people who are learning English as a second language but do not have the time to attend offline classes. The uniqueness attached to the idea is that learning is fun. It is also easy to memorize the context. 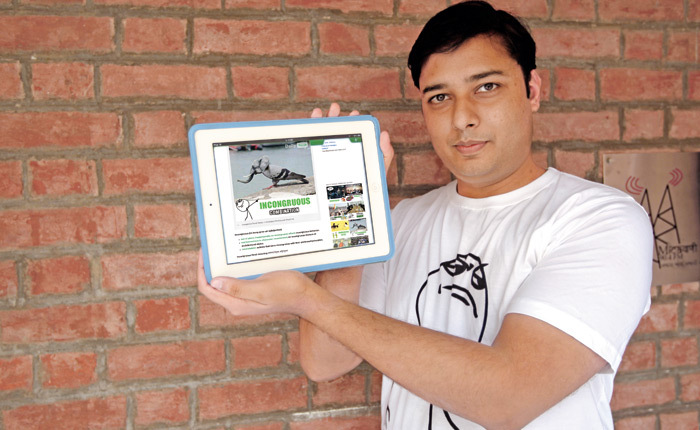 Anshul says, “Initially I started with the idea of providing vocab Internet memes (memory aids for each word) only, but the project has now evolved as a one stop vocabulary solution website. Alongside the word we now offer its meaning in both English and Hindi, synonyms, antonyms, and the recent word usage from news and mnemonics”. In a way, this is an improvement on link method of memory where one has to create mental images of items that one wants to memorize. The use of pictures help to etch the meaning of a word in your memory. For example, in the picture given above, DailyVocabmorphes images of a pigeon and an elephant to explain the word ‘incongruous’, which perfectly puts the meaning in a given context. The idea triggered in 2011 when Anshul’s friend appeared in GRE and shared that had he marked two vocabulary answers right, he would have made to some of the best universities in the US. Anshul, a CAT-taker, knew that both of them had spent countless nights memorizing the GRE wordlist. While he firmed up his idea, he also started associating the words with images and started creating a database. In April 2013, he floated his venture using his own funds. The pilot project is up and running, “With more than 15,000 visitors and 1000+ subscribers on website, we have more than 10,000 fans on our Facebook page. At present, everything is free on dailyvocab.com. I am earning my revenues through various ads served on the website. In future, I will offer only some content for free,” Anshul adds. On his doorstep to the MICA comcubator, Anshul says he would need an office space and mentorship after his PGP course, but more importantly he is longing for an environment which would help him to network. “Currently I am in product development phase and I would require assistance from venture capitalists” he adds. Planning to expand his team by employing two developers and one designer, Anshul wants to cover all exam-related vocabulary words and also launch a mobile app in next six months. “I want the product to be ready for the students who will be appearing for competitive exams in 2014”, he signs off.